router todo en uno), luego mitigamos mediante ACL y autenticación vía hash MD5. 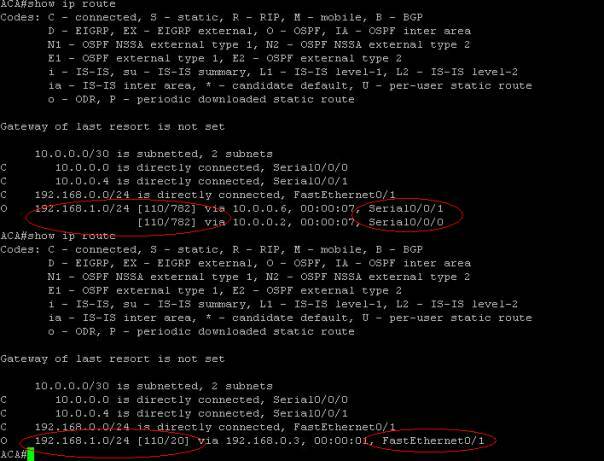 OSPF configurations for MD5 Authentication: MD5 authentication provides higher security than plain text authentication. This method uses the MD5 algorithm to compute a hash value from the contents of the OSPF packet and a password (or key). hash value of the sender which is transmitted with the message.The key ID allows the routers to reference multiple passwords. throughout an area. However, they do need to be the same between neighbors. realmente, pasa a ser inalcanzable para los hosts, aunque figure en la tabla de enrutamiento. Note: The area authentication command in the configuration enables authentication for all the interfaces of the router in a particular area. You can also use the ip ospf authentication command under the interface to configure plain text authentication for the interface. This command can be used if a different authentication method or no authentication method is configured under the area to which the interface belongs. EIGRP configurations for MD5 Authentication Para evitar ataques de DoS a travez de spoofing. they are also configured for message authentication. This does interrupt routing communications on your network.